The Stat-O-Seal is very simply the best sealing washer available. It consists of a synthetic rubber "O" ring mechanically locked to the I.D. of an aluminum washer. When tightened, the "O" ring is compressed, forcing the sealing surfaces around the bolt shank. 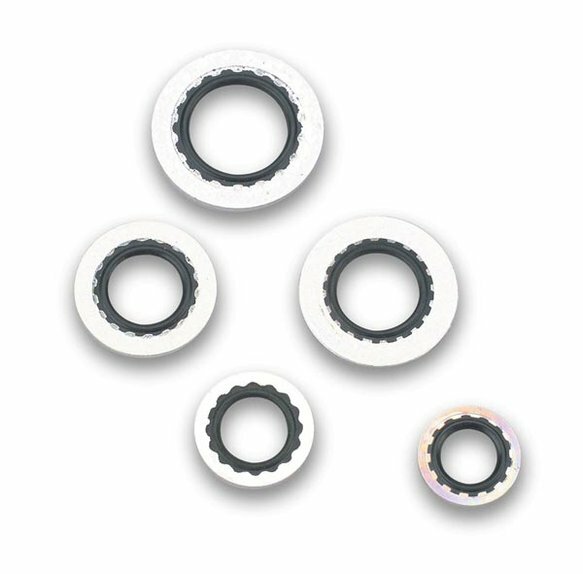 They will form a positive seal over a temperature range of -85° to +450° F. They provide the advantages of an "O" ring type seal without the necessity of machining "O" ring grooves into the part. In any application where you are now using a copper or aluminum sealing washer, the Stat-O-Seal will do a better job.